Michael Vaughan and Steve Harmison may have missed out on selection for England's pre-Ashes camp, but Ravi Bopara insists that the pair could yet force their way into the side for the first Test against Australia at Cardiff on July 8. Vaughan has only managed 159 runs at 19.88 for Yorkshire this season, and his attempt to force his way back into the England side has been further hampered by a recurrence of his long-standing knee injury. Harmison, on the other hand, has enjoyed another good start to the season for Durham, which included 16 wickets in two games, and a return of 5 for 44 on a flat surface to help them beat a powerful Warwickshire lineup. Though he missed out on the pre-Ashes camp, Harmison was named in the England Lions squad to face the Australians. "Michael's a good friend of mine and it's not good to see your friends not in the squad but he's a fine player and I'm sure if he was given the opportunity tomorrow he would go out and do well," Bopara told PA.
"And Steve is a fine bowler. We've seen his recent form has been really really good. He is somebody who can bowl about 90mph and he gets that awkward bounce that no other bowler gets. If he fires and he does well in the warm-up games you never know, we could see him in the squad." 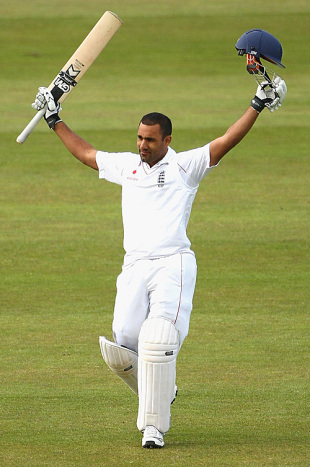 While Vaughan and Harmison appear not to be favoured for the Ashes, Bopara's stock could not be higher. Three Test hundreds in succession against the West Indies, and useful performances in the World Twenty20, have cemented his place in the team, so much so that he is now a vital cog in the batting order, not simply a potential talent. "Obviously it's nice to be involved in the squad, it's a big series coming up for us and hopefully I can go out and do the business," he said. "The Australians are always going to be strong, I don't think you can ever say that they are weak. They are a tough side, they've always been a tough side, and yes it's going to be a real competition for us. Then again we are a tough side as well, the way we are playing our Test cricket, especially on our home turf. "I haven't set myself goals. I don't really set myself long-term or short-term goals. I go out and just try to do the best thing I can do on the day. I prepare myself the best way I can and give myself the best opportunity to go out and do well and if it's my day, it's my day."